It is the easiest and most efficient way to look for jobs. Simply say 'Hi' and let us do the rest. Jawbot can be accessed through Facebook Messenger on any browser or mobile device. Connects you to the most available positions on North America's largest job platforms. 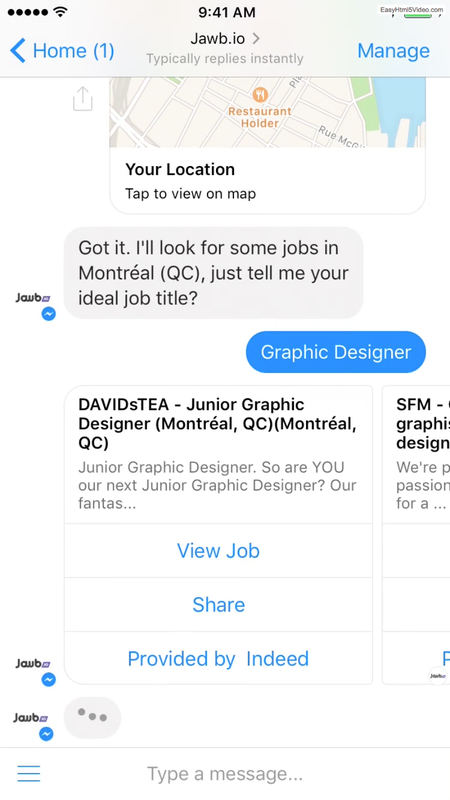 Automatically receive job alerts directly to your Messenger account on a daily or weekly basis. Our main priority is providing employers with the best talent in the digital industry. At Jawb.io, we make our main priority to deliver the best curated talent in the digital industry. That means you'll be spending less time filtering unqualified candidates.